Choosing the Best Flooring when you have Pets. A lot of homes that I visit have pets and I am often asked for the most suitable flooring. If you have a dog then you will probably be looking for an easy clean floor and for cat lovers you need to consider their scratching habits and malting. 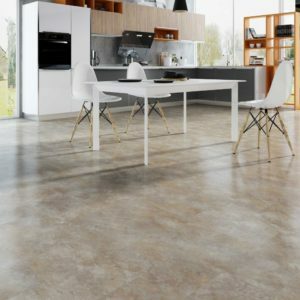 There are pros and cons and things to consider with all of the different types of flooring I sell. I will go through each one individually below but, of course, if you would like some more specific help and guidance then please contact me. What are the Best Carpets if you have Pets? 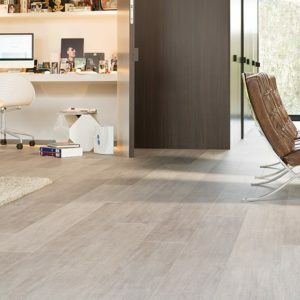 Laminate or a quality vinyl flooring is usually the best option for a hallway because this area of any home is prone to muddy paws and a lot of foot-flow. 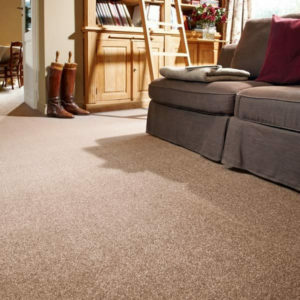 However you can’t dismiss a carpet, it’s usually down to preference and how much usage it gets. If you have pets then I would recommend a flecked/speckled carpet which isn’t too light. This will help with hiding bits, pet hair and should reduce hoovering. Cream colours should be avoided for obvious reasons but black carpet will also show up every little speck of dirt. There are numerous different types of carpets and if you have a cat I would never suggest a loop pile because they just love to scratch and claw at it. A more practical option would be a bleach cleanable twist pile carpet with 100% polypropylene fibres. That’s because it’s so easy to clean stains and get rid of any nasty smells. No matter how tempting a thick fluffy carpet is (see picture), it really wouldn’t be something I’d recommend. You would be better off with a short and compact pile with a thick underlay. It won’t accumulate as much pet hair and debris, the hoover would also work more efficiently. My recommendation would be Cloud 9 11mm Deepstep underlay, this would give a sumptuous feel and reduce the overall cost. That’s because upgrading the underlay is more cost effective than having a more problematic deep pile carpet. Is Vinyl the Best Flooring for Pets? Vinyl flooring is the one of the most popular choices for homes with pets. That’s because it’s less likely to absorb and hold onto smells. It’s also very easy to keep clean, making it a more hygienic option compared to carpet. It is waterproof and therefore can be wet-mopped. I would certainly recommend vinyl for kitchens and hallways in homes that have pets. Some homeowners also have it in their living rooms and dining rooms but it just depends on how much access your pets gets to each room! There are so many different designs and patterns available that you will be able to find a suitable vinyl for any room of your home. Most modern vinyl floors are slip-resistant rated, which will give your pet a better traction. They are also much easier to keep clean, pet hair and any accidents can easily be wet mopped with a recommended cleaning product. Or if you prefer you can use a quality steam cleaner for added peace of mind. The cushioned backing will also make it more comfortable to walk on and if noise is an issue, then I would definitely recommend it. Although it has plenty of advantages it’s not perfect! Vinyl flooring is easier to puncture and tear compared to laminate so this might be something you need to consider. When I call round to your home we can discuss the options that would best suit you and your pets. What about Laminate Flooring if I have Pets? Another very popular choice of flooring for homes with pets is laminate flooring and it’s easy to see why. If done properly, it is very easy to clean up those muddy paw prints and pet hair! But you need to take good care of laminate flooring because it’s not waterproof, so don’t be tempted to use a steam cleaner. 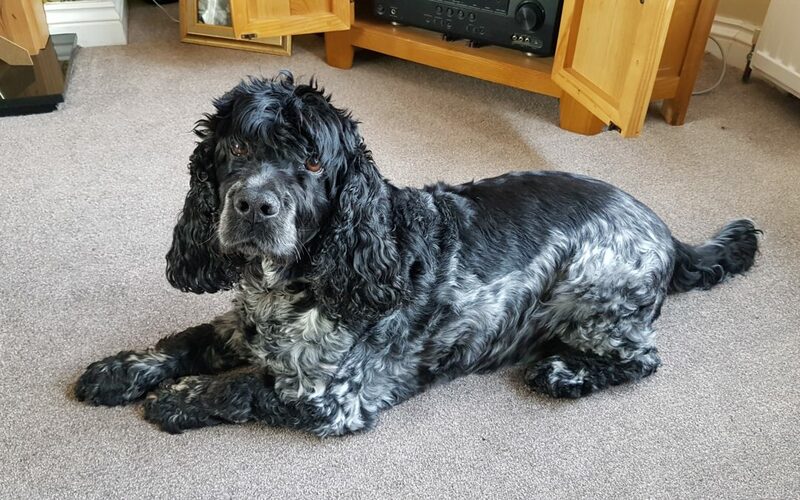 It might also be wise to avoid using laminate flooring in a area you know it will get very wet, for example a downstairs shower room used for cleaning your dog after walkies. Unlike vinyl, laminate is impossible to tear so it will be safe from sharp claws and paws. However, some pets often struggle to get traction on it. That’s because of the very hard wearing transparent wear layer, which can reduce scratching but can act like an ice rink for pets! They get little or no traction at all on its surface, this can be a real health hazard, especially to older pets. And please be aware, it can be quite noisy too. If you would like some advice on how to clean your laminate flooring then please contact me. I hope this article has been of interest and if you have any further questions or if you’d like to book a consultation then please contact me. I offer free estimates in your home and I bring all of my sample books with me. This ensures you a confident colour match with your home décor.